He Adds Food Coloring To A Cup Of Ice But When He Adds An Egg? STUNNING! There is something that happens in the United States every year, and although many people are involved in it, they may not realize the extent of it. For Easter, there are almost 180 million eggs that will be used for decorating or dying purposes. It is a tradition that got its start back in the 13th century and now, it is used even more. It is one of the most popular traditions for the holiday of Easter. When it comes to decorating Easter eggs, you are not limited to only one particular method. As a matter of fact, there are an endless number of methods that include everything from nail polish and glitter to Kool-Aid! Some people even go over the top and use dried flowers and other unusual items. Although many of these eggs are decorated by children, some methods use heavy toxins and chemicals. It’s important not to do that. There are methods for dyeing Easter eggs naturally and they are a favorite of many families. In fact, you can try this particular method and you will be amazed with how brilliantly it works. 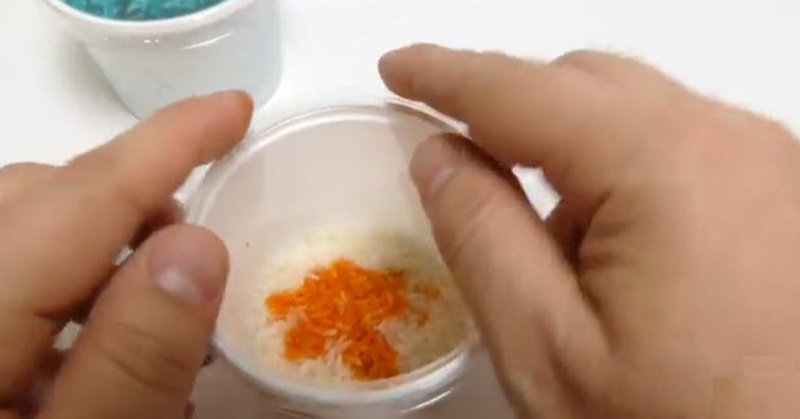 The only ingredients that you will need, other than the egg, are white rice and food coloring. Although it may be simple in the list of ingredients, you will be amazed with how beautiful the eggs turn out when you are done. Something else that you will need are some containers that will include a lid or another type of covering. You can even use saran wrap if necessary. You should also ensure that the cups you use will comfortably hold the egg with leftover room so that you can shake it gently. Use the following directions for rice died Easter eggs. 1. Place 3-4 tablespoons of rice into a cup. 3. Place an egg into the cup and secure the lid on top. 4. Gently shake it all around and at this point you should start to see the food coloring beginning to transfer from the rice onto the egg. 5. Remove the egg from the rice cup when you like what you see. 6. Set the dyed egg aside and allow it to dry off. This may sound simplistic and that is because it is simple! You don’t need to dissolve tablets made of chemical in vinegar or anything unusual. When you are finished, however, you will have some of the most beautifully decorated Easter eggs you have ever seen in your life. Children are also going to enjoy trying out this new technique. It allows them to do it themselves and they can get involved in the creativity because they can play around with how much food coloring and shaking is used. Parents will also find it enjoyable because it is not always simple, it is affordable and super easy to clean up.